The Save Straddie bumper sticker caused a bit of talk on the island during the Christmas holidays when it was handed out with fliers to holiday-makers. Get one for your car at the AGM, by asking a committee member or by requesting one via the website www.savestraddie.com. 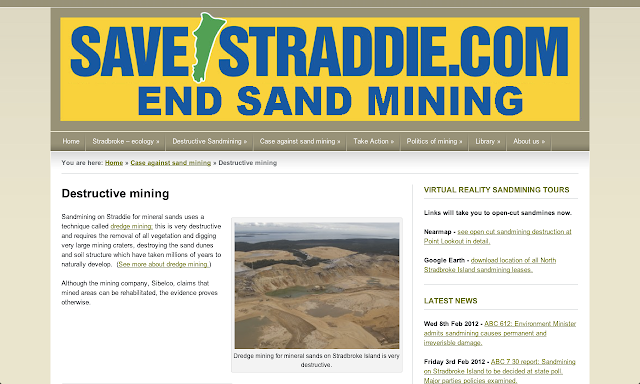 Next time you are online check out savestraddie.com. You can download information and newsletters, request a bumper sticker and read the latest media clippings. From the site, you can also send an ‘eblast’ to the Premier calling for the refusal of Unimin’s applications to renew around 20 expired mining leases – the first essential step in ending sand mining on the Island. In your email you could make particular mention of expired ML 1117. It expired on 31 October, 2007! Yet mining is continuing to destroy pristine old growth forests in the mine’s path. This is a key part of the campaign to Save Straddie and a great way to get information about Straddie out to the public. 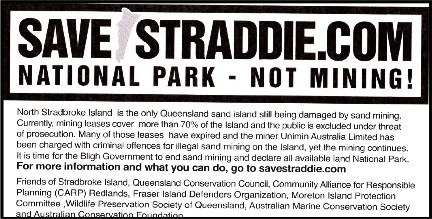 The advertisement above has appeared in the Courier-Mail a number of times this year to help spread the word about the urgent need to stop mining and save Straddie. National park - not mining!